Nico from Motorini is devoting the month of October to the SYM Symba. Offering a super deal on this very cool timeless classic. The SYM Symba is a unique looking proposition. The Symba is very much in the postie-bike mould, though think a little more refined and not as agricultural. 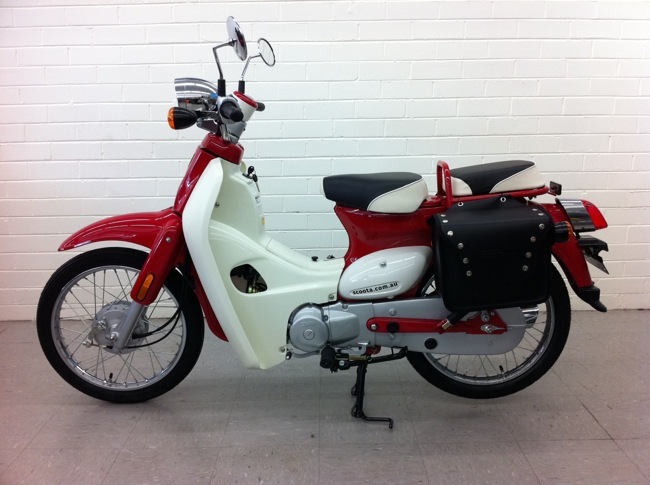 When we first rode the Symba, we could clearly see the benefits behind having large wheels, a semi-auto transmission and a frugal 101 cc engine capable of 95 km/h. Life is simple and the Symba rewards with being a fun, frugal machine. Not forgetting you're going to turn a few heads wherever you go. 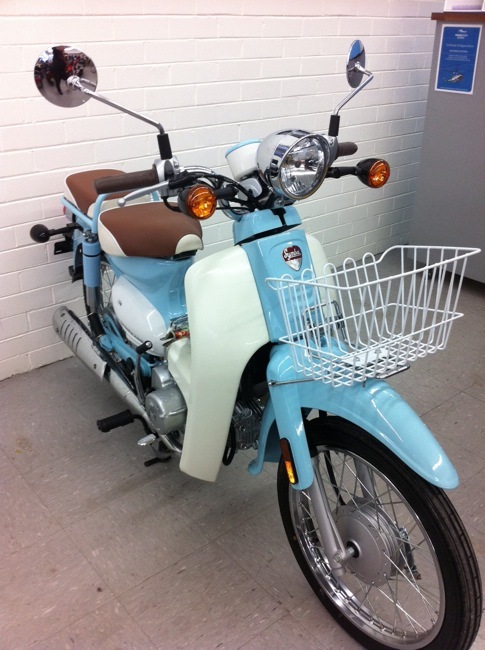 Nico from Motorini in Canberra has spent a fair amount of time in Asia and loves the Symba concept. Now he's taken his love affair one step further declaring October, "Symba month at Motorini". For the month of October Nico is offering the Symba at $2850 Ride Away (12 months ACT Rego). On top of this Nico is offering 20 % off SYM Symba specific accessories. Above - Front Carry Basket, Front Chrome Rack. Honda develops a global 125 cc engine for use in the next generation of scooters. Honda Motor Co has announced its development of an engine with enhanced durability, quietness, and fuel economy. 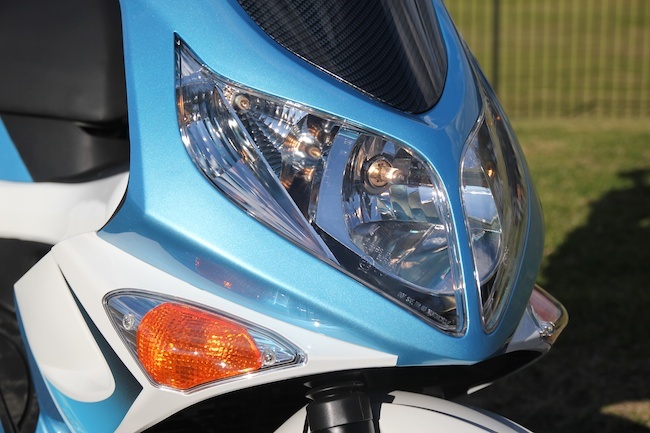 The engine is developed for the next-generation of 125cc scooters and accommodates an advanced idle stop system for motorcycles. Fuel economy is approximately 25% better than that of conventional engines for scooters with the same displacement. This liquid-cooled, 125cc, 4-stroke, single-cylinder engine incorporates a wide range of low-friction technologies while packing its lighter weight in a more compact body. This new engine will be mounted on a variety of 125cc scooters to be sold in many countries around the world and is planned for global rollout starting from 2012. This new engine was developed to offer highly convenient and attractive 125cc scooters, a vehicle used by many customers for commuting in various countries around the world, while reducing CO2 emissions on a global scale, through the further enhancement of engine performance and fuel economy. To achieve the engine's excellent fuel efficiency, Honda incorporated a broad spectrum of new ideas to thoroughly reduce friction. Low-friction technologies such as an offset cylinder and a roller rocker arm are supplemented by such techniques as intelligent control to lessen friction during power generation and the first adoption of a shell-type needle bearing for the rocker arm shaft. Offset cylinder reduces friction caused by the contact between the sliding piston and the cylinder. Piston weight has been thoroughly reduced through CAE analysis. A spiny sleeve with minute spines on the outer surface of the cylinder sleeve has been adopted to reduce oil consumption and improve cooling performance. A shell-type needle bearing is used for the rocker arm shaft to reduce friction. Smaller and lighter rollers together with an optimized cam profile and valve spring load. Radiator core with high cooling efficiency has been adopted (approximately 1.5 times the efficiency of current models). This enables a smaller and lighter cooling fan on the back of the radiator and reduces friction loss by approximately 30%. Transmission oil capacity is reduced 25% compared to current 125cc engines through modifications inside the transmission case in order to lower the oil agitation loss. Bearings for each of the three axes in the transmission unit are exclusively designed according to the load received, resulting in an optimal set of specifications that lessen the rolling resistance inside the bearings. Friction loss has been cut by approximately 20% compared to the current engine (when running at 50km/h). A compact combustion chamber design incorporates burning velocity and cooling performance suitable for an engine that emphasises torque characteristics in the rpm ranges actually used by a 125cc scooter. The air intake port connection to the combustion chamber has been redesigned into a smoother shape that does not impede the flow of the fuel-air mixture. Optimal ignition timing is set due to improved knocking resistance created by a highly efficient radiator and a water jacket that efficiently cools the combustion chamber. Smooth and remarkably quiet start has been realised through an electronically-controlled ACG starter, which serves as both a self-starter and a dynamo. An advanced idle stop system has also been realised. Intelligent electronic control improves fuel efficiency through the reduction of friction during power generation. A swing-back that returns the crank to its position before air intake is electronically controlled for easy restart, while a decompression mechanism mitigates cranking resistance arising from compression during engine start. A wide-ratio continuously variable transmission with V-belt (V-Matic) utilises a drive belt made of newly developed high-elasticity rubber. Both excellent fuel efficiency and quietness are achieved through the efficient transmission of driving force by optimising the lateral pressure applied to the belt, along with the durability of the belt. Eicma Milan 2012 is drawing near and with it are the sneaky previews of models to be launched. Come early November the internet will be flooded with news from this years Eicma show in Milan. Brands are already releasing snippets in a hope that punters can hold out a little longer to upgrade on what will be the latest and greatest. 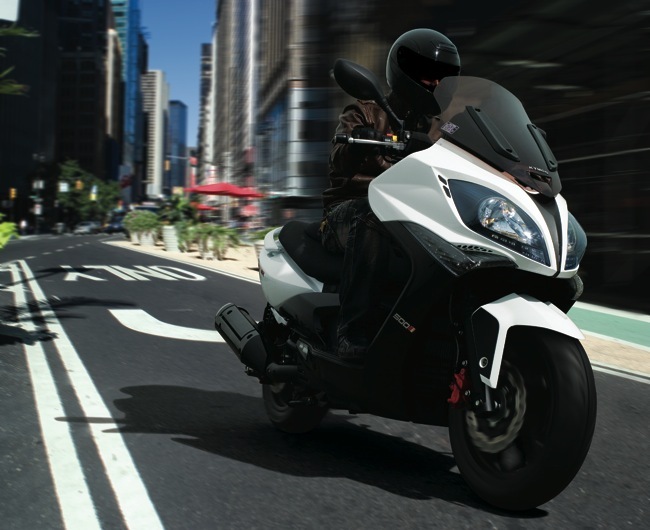 Likewise, Kymco have given the world a sneak peak of a dedicated sports model code named the K-XCT. 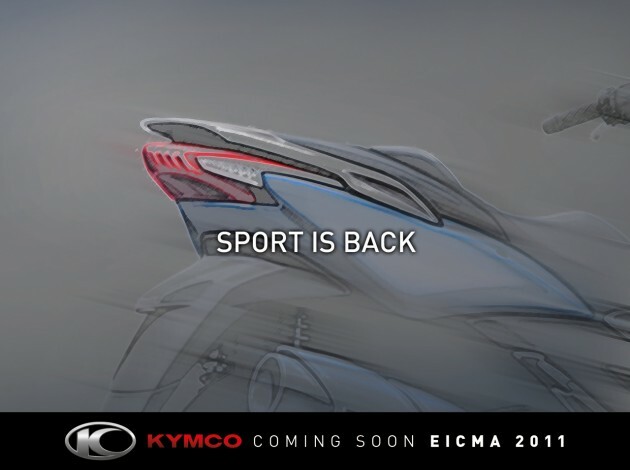 Kymco Europe has released a sketch of the rear of this model and already, much has been anticipated. The K-XCT will be available in a 125 and 300 cc variant. The G5 engine we now find in the Downtown 300 will also find itself in the K-XCT. Liquid cooled, 4 valves per cylinder and a stack of power. What we do know is that Kymco will be targeting the sporting scene with a short, compact, low weight chassis and a real emphasis on performance. 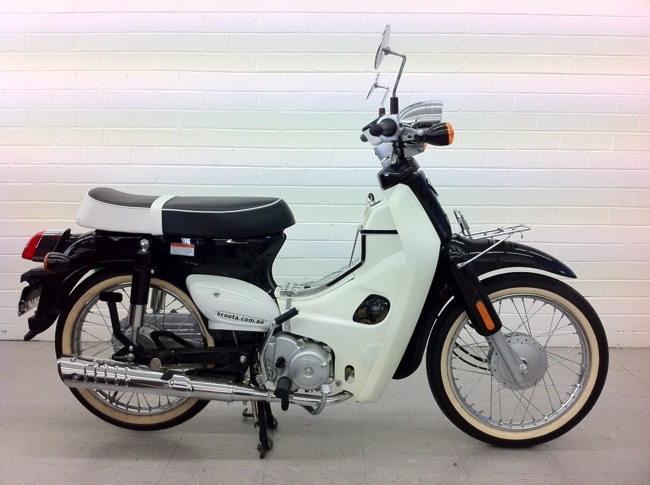 Other news is that Kymco will release the Xciting in a 400 cc version, a new larger G5 engine/transmission combination. This would probably see the end of the 500 cc Xciting as the power to weight ratio would favour the 400. Both these models are bound to create plenty of interest in Milan as they look right on target to suit the Italian market. 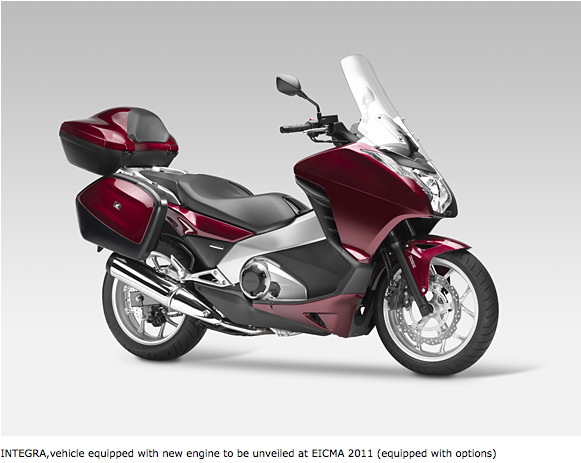 Honda develops new fuel efficient 700 cc engine. Concurrently they develop a new large capacity scooter that uses Honda's 2nd generation Dual Clutch Transmission. 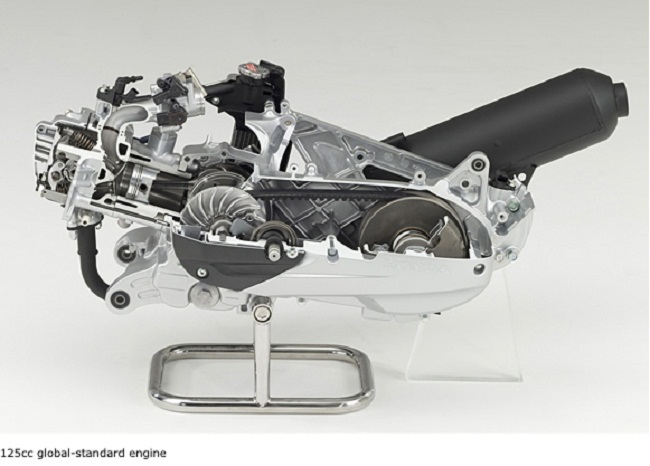 Honda Motor Co., Ltd. has announced the development of a new motorcycle engine with powerful torque in the low to mid-speed range and top class, fuel-efficient performance, along with a second-generation Dual Clutch Transmission. This new engine is a liquid-cooled, 700cc, 4-stroke, in-line, 2-cylinder engine that fits into the mid-class range (displacement between 500 and 750cc) popular in Europe. Fuel economy exceeds 27km/L, best in the mid-class range, and achieves an approximate 40% improvement over other sports models in its class. This new engine can be coupled with a newly developed lightweight, compact second-generation Dual Clutch Transmission, featuring a smooth, direct feel and excellent transmission efficiency, in addition a 6-speed manual transmission. This new engine will be mounted on three models based on different concepts, which are slated for exhibition at EICMA 2011(69th International Motorcycle Exhibition) to be held in November in Milan, Italy. 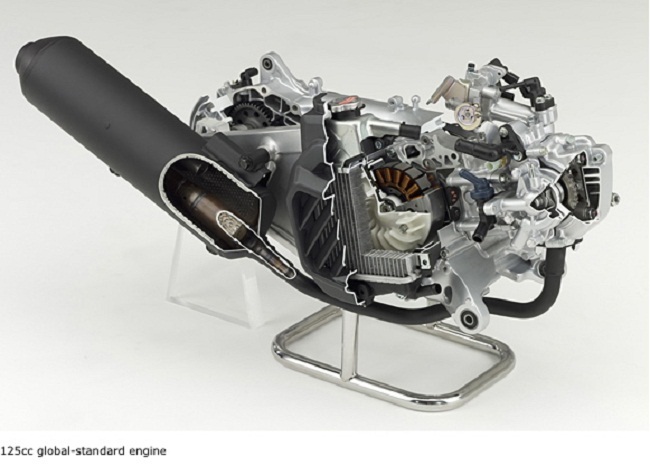 Honda developed this new motorcycle engine in order to realise a set of motorcycles based on its new concept of offering outstanding fuel efficiency in the mid-class while delivering powerful, throbbing torque in the normal range for touring and urban riding. An engine that is easy to handle with plentiful torque in the range normally used, and which also delivers a pleasant, throbbing feel during sporty rides. Top-class, fuel-efficient environmentally friendly performance best suited for the next-generation mid-class engine. Honda determined the engine layout after examining a variety of engine types from numerous perspectives and decided on an in-line, 700cc, 2-cylinder engine with a 62º forward lean (cylinder assembly angle). To meet a wide variety of uses, two transmissions can be coupled with this engine: the second generation of Honda's innovative Dual Clutch Transmission, and a 6-speed manual transmission. A wide variety of low friction technologies that aid better fuel economy are incorporated: To improve fuel efficiency through better-controlled combustion while realising a powerful ride in the low to mid-rpm ranges, the bore-stroke ratio is set at 73×80mm. An ideal combustion chamber shape and optimum valve timing also contribute to achieve stable combustion. Resin coating is applied to the pistons, and lightweight aluminium material is employed for the first time in a motorcycle in the friction-reducing roller rocker arm. Adoption of uneven-interval firing with a 270° phase crank and uniaxial primary balancer help realise an engine with a pleasant throbbing feel that also reduces vibration. The layout of a branch intake port inside the cylinder head was chosen to have only one intake channel for two cylinders. This design creates deliberate interference between the two cylinders" intake processes to achieve precisely calculated changes to combustion timing. In addition, to change the valve timing between the two in-line cylinders with one camshaft, the specifications provide for a cam with two timing routines for the intake valve. Through these measures, subtle combustion changes can be generated to give the engine a delightful, pulsating feel. To maximise the efficiency of exhaust emission purification so that the catalyzer, a three-way catalyst, can be started promptly after the engine starts, the catalyzer has been placed directly beneath the exhaust ports. This design lets the combustion gas pass through the catalyst while the gas is still hot. In addition, a combination of measures, including the adoption of an electronically-controlled fuel injection system (PGM-FI), allows the engine to achieve an emission level approximately half the European emission standards (Euro 3). The resulting environmental performance is ranked among the top in the world without compromising powerful, smooth output. The Dual Clutch Transmission, developed for the first time by Honda for motorcycles and installed on the VFR1200F, is now lighter and more compact through a simplified hydraulic circuit and other design enhancements. A learning function has been added to each selected running mode to detect a variety of riding environments from city streets to mountain passes and automatically performs the most suitable shift control. 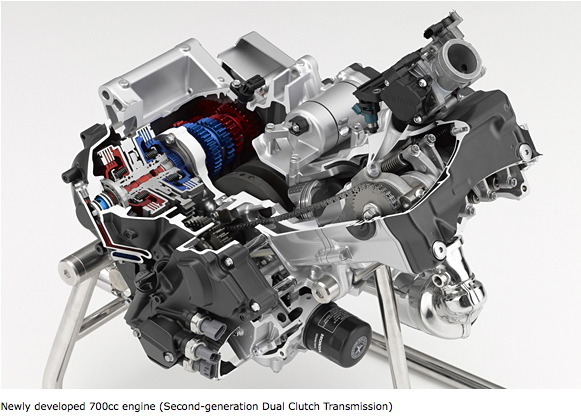 Although it is an automatic transmission, the Dual Clutch Transmission delivers fuel economy on a par with manual transmissions as a result of its excellent transmission efficiency. 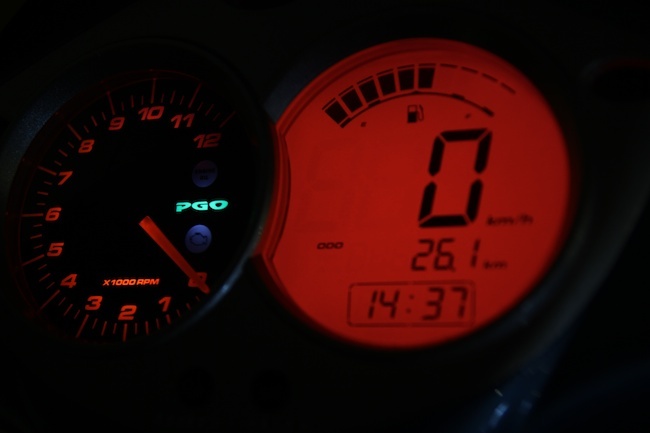 A rolling update on the PGO G-Max 220i. For those waiting to see this model hit Australian showrooms the last week of October is the anticipated time of arrival. The G-Max 220i will be the only low capacity scooter on the market that runs a central motorcycle-type frame. Other features include disc brakes front and rear and 13 inch wheels all-round. 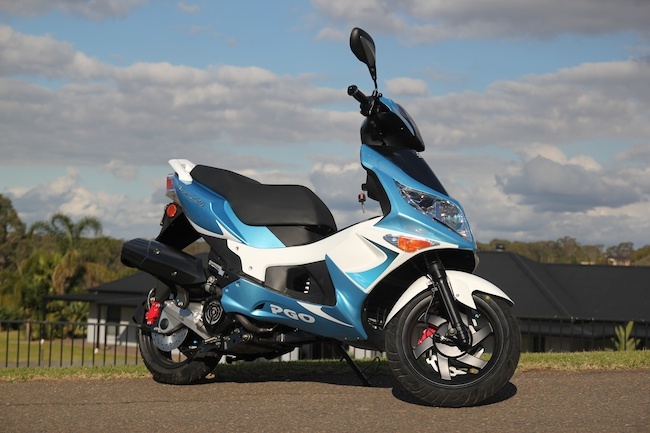 The G-Max is a full 220 cc capacity, for those in NSW this means cheaper insurance. Consistency of power is helped by the addition of an oil cooler and on our early rides the G-Max feels smooth thanks to the help of fuel injection. All up the G-Max weighs in at 144 kg. Look out for the G-Max 220i coming soon in a dealer near you. To find that dealer check out www.motorsportimporters.com.au. Suggested retail is being hinted at under 5 grand. 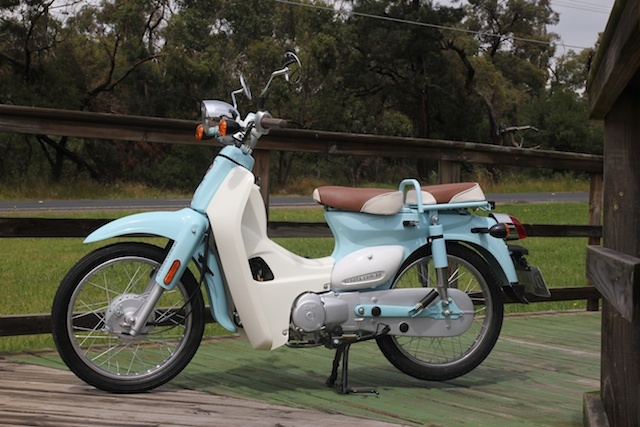 See the Australian developed hybrid on display at the first ever Sydney Scooter Expo. This Saturday the 10th of September, HART St Ives will be showcasing scooters from all the top brand names in Australia. Honda, Yamaha, Vespa, SYM and TGB are just to name a few. Turn up, take a browse, even test ride* your favourites. One special mention goes to the FMH (Freedom Modern Hybrid) Sayza, an Australian designed hybrid scooter currently being developed for the Malaysian market. This is a joint venture between Fusion Hybrid Engineering and Victorian based company DPM Engineering. Together they are currently devising a business model to bring two-wheeled hybrid technology to Australia. 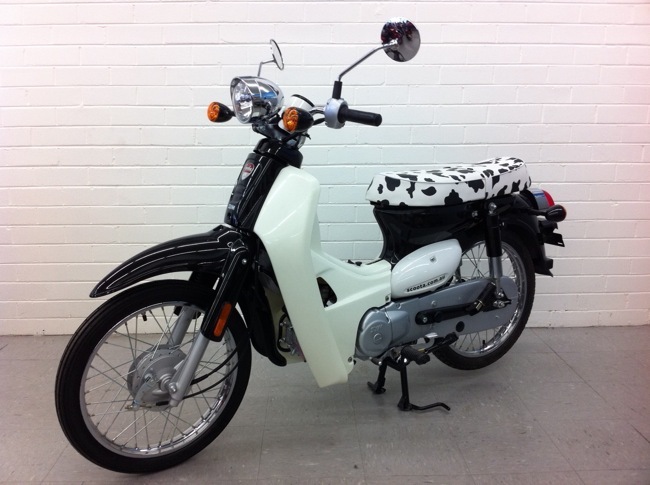 The FMH Sayza consists of a 125 cc combustion engine with a rear-hub electric motor. Drive is through a dual action magnetic clutch and the choice of power is controlled by a 3-way selector switch. Select petrol only, electric only or let the on-board control unit decide. The key advantages of the system include a claimed 30-40% reduction in fuel usage and a claimed 50% reduction in emissions at low speed. DPM Engineering are promising no reduction in performance to a similar capacity scooter, in fact they are claiming better performance under heavy acceleration. The Sydney Scooter Expo is a one day event being held at the St Ives Honda Rider Training Facility. Easy parking for scooters and motorcycles, a BBQ will run all day, even some music to sooth the soul. The National Scooter Rally will be present for the annual show and shine. 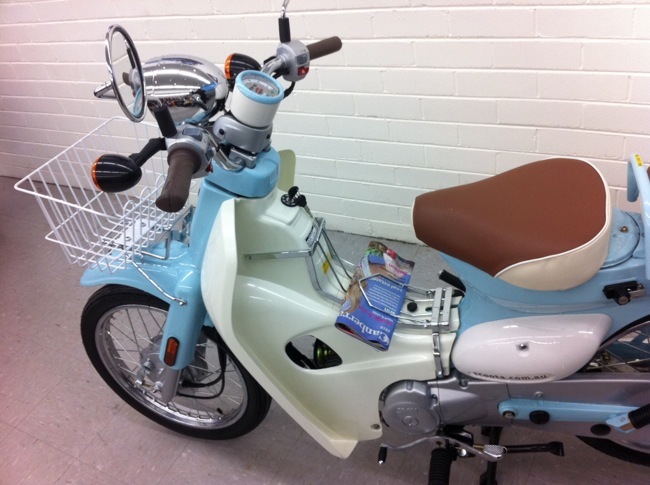 Join the expo on Saturday the 10th of September, find out more by visiting http://www.scootersales.com.au/. Pre-registration for test rides* can be carried out by visiting the Test Ride Registration Website. * You must be eligible to ride i.e. Have an applicable riders licence from your state or territory.